While researching Finland's asylum application procedure on 2 March 2012, I came across an unsettling news report about people of Romani descent, published by YLE, a major English language news outlet in Finland. The article, titled "Beggars Seek Asylum in Finland" picks on the Roma - a minority group that has historically been discriminated against and pushed to the fringes of society in every European country where they find themselves. [Source]. In 2010, people of Romani descent were deported from France - in violation of EU rules on freedom of movement. In Finland, according to a poll commissioned by Helsinki Sanomat, the Roma, besides Somalis and Muslims in general, are disliked the most. The news item published by YLE does nothing but fuel such negative attitudes toward the Roma by tying them to three things: begging, asylum, and social welfare benefits. 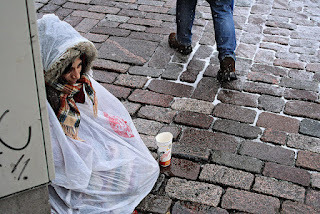 "Beggars of Romani decent from Rumania have begun seeking asylum in Finland. Over 50 applications for asylum have been submitted to police at Helsinki-Vantaa Airport. Some of those seeking asylum are actively engaged in begging on the streets. The Rumanians cannot, however, be granted asylum as they are EU citizens. They have the right to social benefits for as long as the applications are processed. During this period they can reside in a reception centre and are entitled to receive social benefits to the tune of 292 euros per month if they procure food themselves or to 87 euros monthly if they consume food provided by the centre. In April, the number of asylum applications submitted by Rumanians was equal to their total number last year. Mindful of the fact that not only the Roma are seeking asylum in Finland, it is unclear why this report focuses on the Roma. There is something inherently wrong with picking out one group of people from the pack. Immigration, asylum and social welfare benefits are political hot potatoes and frequently used by a growing number of far-right extremists in Finland to fan hate against immigrants and other minority groups. YLE knows better that vulnerable groups tied to these hot potatoes could easily get burned. Such reporting fuels negative sentiments against people of Romani descent from Romania and elsewhere by insinuating that their sole aim is to benefit from Finland's welfare system. It's of utmost importance that asylum cases be dealt with on individual basis. It would be more helpful and less prejudicial for YLE to shine the spot light on why the Roma are fleeing Romania and other parts of Europe to seek asylum in Finland and why they beg rather than find decent work. It would be interesting to know whether employers in Finland are willing to employ "the Rumanians" without discrimination, even in unskilled jobs, so that they won't have to beg on the streets to make a living. 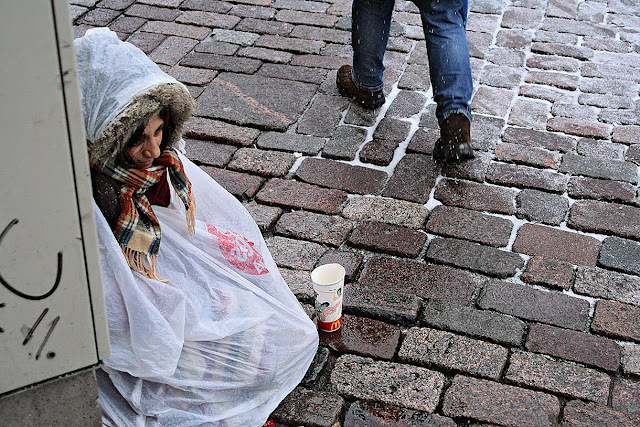 *Photo of Roma woman begging in Helsinki: Kukka Ranta.